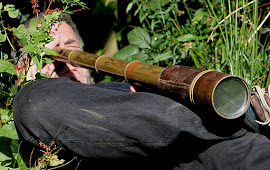 The Grumpy Ecologist: What's happened to cold weather? What's happened to cold weather? 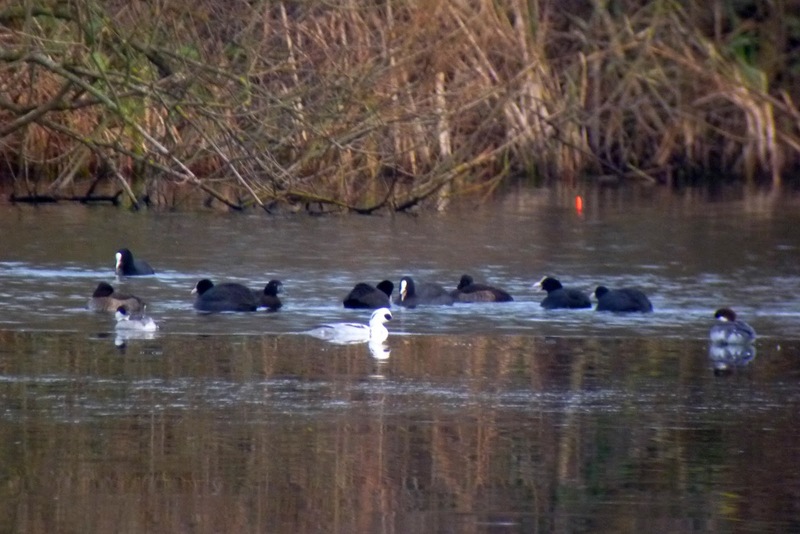 R-b Merg on the KGV, packed-in Tufties at Nazeing and Smew at Cheshunt. What’s happened to cold weather? When we had it in the 80’s we were splattered in scarce grebes, divers, gulls and other stuff. This winter has been rather slow, a few Bitterns and Smew (but barely more than usual) and not much more so far. Okay, there were some Eider on the Girling today, and we are knee-deep in Waxwings, but overall it’s not like it used to be. In early 1979, strong north-easterly winds precipitated a remarkable influx of, amongst other birds, grebes, divers, Smew and Goosander. 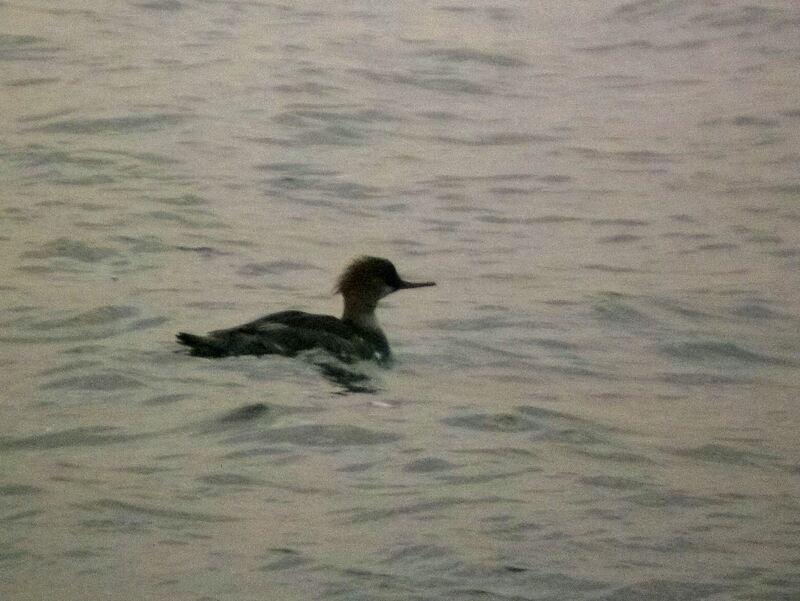 Within a month my Lee Valley list included 12 Red-necked Grebes, 30+ Red-breasted Mergansers, 2 Slavonian Grebes, 2 Black-throated, 2 Great Northern and a single Red-throated Diver, 26 White-fronted Geese, Hen Harrier, 5 Long-eared and 6 Short-eared Owls. Likewise, in early 1985, severe weather resulted in a massive influx of Smew (up to 40 at Holyfield Marsh alone), Scaup (9), Slavonian Grebes (5), Red-necked Grebes (4), Velvet Scoter (3), Long-tailed Duck, Bean Goose, Glaucous Gull, Shag and Hen Harrier. However, judging by the length of my notes, a Mediterranean Gull was the most exciting. Is this current weather not blasting easterly enough, has climate change shifted the distribution of some of these birds, or are there just fewer of them nowadays? Or perhaps a bit of all three? Cold weather refuges are critical for wintering waterbird populations. 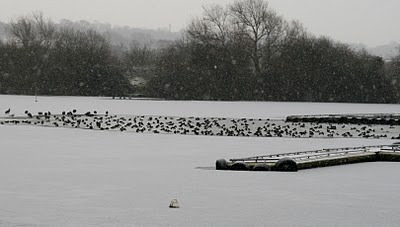 These may be provided by the larger, deeper waters of the reservoirs that rarely freeze, or by sites that have flowing water, such as the rivers or the sewage treatment lagoons at Rye Meads. The winter of 2008/09 provided an opportunity to record hard-weather effects in the valley during the short freezing spell in early January. At this time, up to 2,000 birds may have left the valley, with around 1,000 returning as milder conditions prevailed. 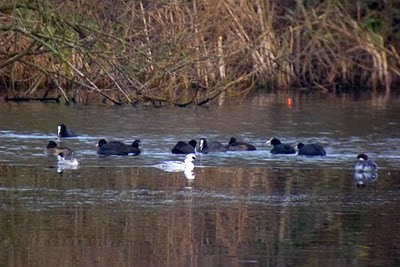 Dabbling duck were mainly affected with losses of Gadwall, Teal and Shoveler but significant numbers of Coot also left. Birds also re-distributed; Gadwall concentrated on Netherhall GP and the King George V Reservoir, as sites such as Amwell NR, Holyfield Marsh GP and Cheshunt GP froze over. presumably not all cold weather is the same. didn't the cold weather in the 80'scome from the East, so birds were frozen out of Europe? The cold weather now has come more from the north so its our birds that are being displaced? Yes, I agree, but I suspect that's not the only factor. Some species are now present in much smaller numbers for various reasons. Regarding Lap Bunts, I was only considering movements caused by the recent cold weather, their invasion started back in late August/September I seem to remember. Also redpolls of course, and much more fun to try and sort out. Revision of the 30 cm rule. Ouse up and Ouse down?